Hanoi (VNA) – The international media have praised Vietnam’s U23 team as it has qualified for the finals of the 2020 Asian Football Confederation (AFC) U23 Championship with a perfect record of three wins in the qualifiers’ Group K.
In particular, Vietnam beat Thailand 4-0 in the last group match, marking the biggest victory against their Thai rivals in an international men’s football tourney. 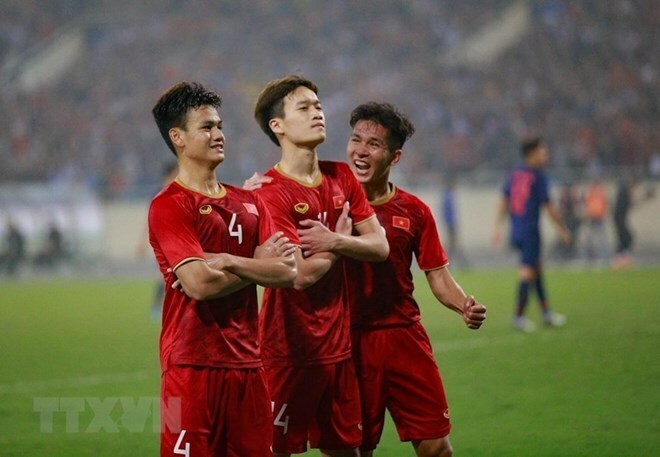 In an article entitled “Vietnam show their class” on its website, the AFC wrote that Vietnam advanced to the finals in style as they beat Thailand 4-0 in Group K of the AFC U23 Championship Thailand 2020 Qualifiers at the My Dinh Stadium on March 26. Meanwhile, the website Fox Sports Asia wrote: “In what was a comprehensive win for the Golden Dragons, they were benefitted a bit by Supachai Jaided’s sending off early in the second half. However, that doesn’t take away the fact that they put up a commendable performance and deservedly booked a place for themselves in next year’s AFC U-23 Championship”. This performed showed exactly why Park Hang-seo’s men are the best among ASEAN sides, it added. Aside from Thailand, which have a place as the host, Vietnam are the sole ASEAN representatives qualifying for the 2020 AFC U23 Championship. Indonesia’s media also hailed Vietnam with articles in Tribunnews newspaper and BolaSport, lauding the team’s win against Thailand at the My Dinh National Stadium and its berth in the final rounds in Thailand next year. An article of Thailand’s sports website Siam Sport described it a “nightmare day” for Thailand. The author said it is the same score as the big set, when the country’s national team lost to Uruguay 0-4 on March 25 at a recently-concluded football tournament in China, but this time, to Vietnam. Inter Football newspaper of the Republic of Korea said this victory against Thailand will help Vietnam gain confidence in their future matches, particularly in the upcoming 30th Southeast Asian Games. Another Korean website news.joins.com briefed the three wins of Vietnam in the qualifiers, along with the celebrations of thousands of football fans at the My Dinh Stadium and Hanoi’s streets. This time will be the third one that Vietnam have entered the AFC U23 championship final round, after the 2016 and 2018 editions. The final 16 teams who will take part in the final round will be divided into four groups. As the runners-up of the continental football tournament in 2018, Vietnam have been placed in the first pot along with defending champions Uzbekistan, third-place winners Qatar and hosts Thailand. The 2020 AFC U23 Championship final round’s draw is set to be held in October, while the tournament will take place from January 8- 26, 2020 in Bangkok capital city and Pathum Thani province of Thailand.